It was a 9 day trip but we spent 4 whole days travelling. Travelling took up much of the time we spent in vietnam and china. Going from one place to another took an average of 3 to 4 hours. The actual sightseeing was only 1 to 2 hours. On the flight back, I encoutered my worst turbulence. Within a split second, many people flew out of their seats. In Hanoi, a trishaw took us around the centre of the city. Motorcycles formed the bulk of the traffic. The roads were strewn with rubbish despite the city's cleaners that seemed to work through the night. It was really a very busy city. 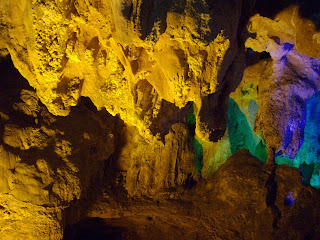 We went off to Halong Bay to see the limestone rock formations and a cave. But the weather was really cold and a mist covered the rocks in the distance, obscuring our view. 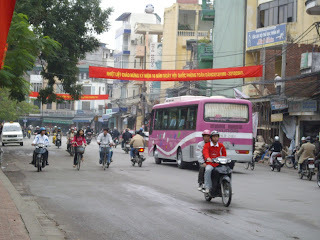 After one night in Halong we were driven off to the border of China and Vietnam. The road there was small and horrible and the bus jerked and jostled constantly. There were times when it even swayed dangerously from side to side. When we crossed the border, we met our Chinese tour guide, Bobo who is a minority individual. She's from the Yao 族. My brother and I had a shock when we met her. Cause she had on pretty heavy makeup, bright red lipstick, a bright light blue long jacket and she was carrying a colourful "lantern" or 绣球. She was an abnormal splash of colour amidst the dull and grey skies of China. In the next 4 days, we got to know more about her and the more I knew, the more impressed I was. We spent the first night in China in 南宁 the capital of Guangxi. It was a big city with lots of bright lights. Much brighter than Singapore. The 4th day we travelled 4 hours by bus to 德天瀑布 and then we travelled 4 hours back to 南宁. 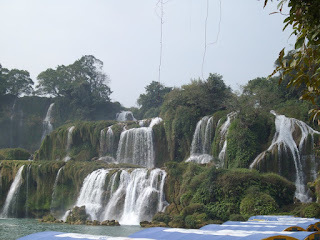 The waterfall that straddles Vietnam and China. On the left bank is Vietnam and the right is China. We moved house the next day. 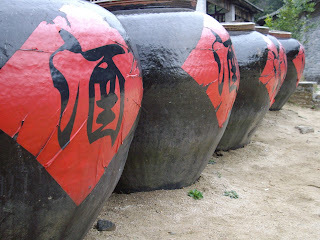 On the 5th day, we moved to the city of 桂林 to 游山玩水. When we first arrived, we went to a tea house, walked around some garden, and got a foot massage. 桂林 was really cold that time we went there and even with the big jacket and gloves my fingers were still chilled. At night, we went to watch 梦幻漓江. The stage and lighting was fantastic and the music complemented the acrobatics play and ballet very well. It was an hour of great performance. Then we went to see the night lights of 桂林 which were really very beautiful. Crossing the road in 桂林 is one of the most exciting things that happend on this trip. Traffic came from all sides and the motorists were going pretty fast. It was very difficult to cross. But thanks to our 导游 we managed it. This night was freezing and the photos we took all didn't have fingers cause we stuffed them into our jackets. 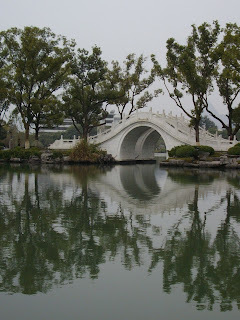 On the 6th day, we toured 桂林 to see what the city looked like in the day. I thought the water level in the lake was too low to form a picturesque scene. Then we went to 流三姐 garden and watched a performance. Then we took a bus to 阳朔. I quote Bobo, "桂林山水甲天下, 阳朔山水甲桂林" . Upon reaching we went down to 漓江 to look at the moutains. The reflection was really nice but I was really very very cold at that point in time to care for the scenery around me. Both my hands and feet were freezing. I really admired the locals who dressed so thinnly but didn't seem affected by the cold. At night we watched 映象流三姐 which sadly failed to meet my expectations. After so much hype about it, I expected much more. The 7th day saw us going to 桂林银子岩. It was really very pretty. And surprisingly it was very warm inside. After 5 mins in the cave we all took off our jackets. But I don't have a great liking for caves and after half an hour I was wanting to get out. Then we went to look at some mountains and tried to imagine them as camels, bears, ladies, immortals, horses and elephants. It took quite a bit of imagination. 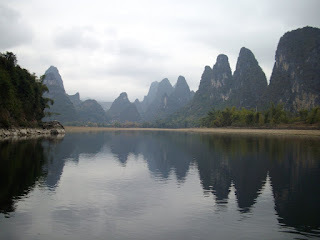 We toured 漓江 on some boat. On very still water, you could see the reflection of the mountains on the water, as if there were mountains in the water too. That day we spent a night at 贺州. One of the most spectacular view in 银子岩. 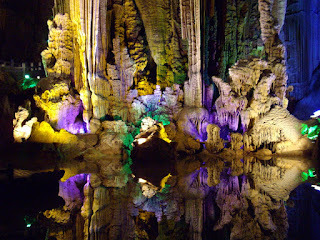 The still water forms a perfect mirror such that it looked like there was a canyon below. On the 8th day we went to 姑婆山. its like some nature park but we dint spend alot of time there. Moreover, someone from our tour group fell sick, almost fainted. The weather was cold and we were invited to sample some wine. 9%, 18% and 38%. There were even higher percentages but I took one sip of the 38% one and put the cup down. It was like the alcohol used to sterilize labs. That day was very cold. Temperature dropped to 6 degree celsius. The lady had to be sent to hospital and put on drip. She would meet us at the airport the next day. That night we went to 肇庆. 肇庆 was big and prosperous. Traffic was much better too although their zebra crossings work differently from Singapore's. We shopped there on the last day and also had a chance to sit a boat through the lake in the centre of the city. And then it was a 2 hour bus ride to 广州 airport and back to Singapore. My tour guide is cool cause she's from 2 minority groups, one is Yao. Yao is a 母系社会. A matriachal society. These people live to ripe old ages. 65, 85, even 100 is not uncommon. I would call them healers for they have great medical knowledge that has been passed down over the years. 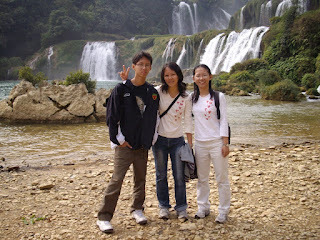 She told us alot of stories, not just of Guilin but of Xizhang as well. She's charming but she's fierce. When our driver is missing, she will not hesitate to yell across the street for him, attracting stares from many. She has inheritable heart disease and is a person with important connections which got on the list as the 59th out of 60 people to get an artificial heart transplant. When she talks about Guilin, Xizhang or her homeland, you can hear the pride in her voice, the pride of being a citizen of China. 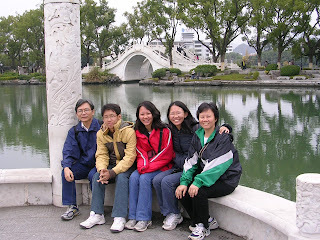 As my dad said, we merely toured a small part of Guilin and we spent most of the time travelling. 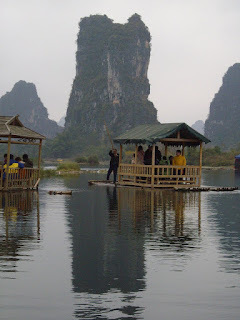 If we really want to tour Guilin, we need a long time and probably not with a tour group. Travelling is really tiring. The good thing is that I had my brother for company on the bus and we exchanged stupid comments and interesting observations. A lot of people mistook me for the elder sis and my sis for the younger sis, much to my amusement and her indignant. But it's alright, in many ways she's still more mature than me. 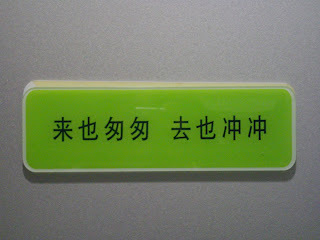 The sign on the toilet door at Guangzhou airport. The toilets in China were okay I guess. Nowhere near as good as Singapore's, but bearable when nature calls. It was just 2 or 3 times that we encoutered toilets without doors. Although most of the times doors for toilets don't work. One wonders why they bother making them in the first place. My bro doesn't smile in the photos. So in most of the photos he looked like some 不爽流氓. I was hard pressed to get him to smile. When I asked him why, he said he didn't look good when he smiled. -.-"
My bro, me and my sis.